United States says it "remains willing to engage North Korea bilaterally"
In September, North Korea announced extracted plutonium was being "weaponized"
(CNN) -- North Korean leader Kim Jong Il has again indicated willingness to participate in bilateral talks with the United States and return to six-party talks over its nuclear program, China's Xinhua news agency reported. 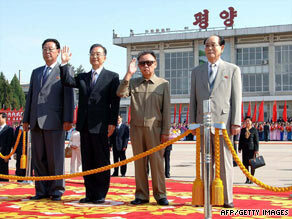 This KCNA photo shows Chinese Premier Wen Jiabao, second left, next to N. Korean leader Kim Jong Il, waving. The attitude shift by North Korea -- which pulled out of talks in April to protest the United Nations' condemnation over its nuclear test and missile launches -- came amid Chinese Premier Wen Jiabao's weekend visit to Pyongyang, Xinhua reported Monday. Wen left Pyongyang for home Tuesday morning after a three-day visit. The reclusive communist country also expressed such openness to talks last month after Kim met with Chinese special envoy Dai Bingguo. The six-party negotiations include the United States, South Korea, Japan, China and Russia. In response to the reports, U.S. State Department spokesman Ian Kelly said the United States "remains willing to engage North Korea bilaterally within the framework of the Six Party process to convince North Korea to take the path of complete denuclearization." Still, in a September letter to the United Nations, North Korea announced that Pyongyang's"reprocessing of spent fuel rods is at its final phase and extracted plutonium is being weaponized," state media reported at the time. Will Wen's visit return North Korea to the table? North Korea could enter the final stage of uranium enrichment, it said in the letter to the president of the U.N. Security Council, according to state-run KCNA. When enriched to a high degree, uranium can be used as weapons-grade material. Plutonium can be used in atomic bombs. Despite stating in the letter that they "totally reject" a Security Council resolution in June that demanded that the country no longer pursue nuclear weapons, the North Koreans said they are "prepared for both dialogue and sanctions," KCNA reported.